Setsuyo Astec Corporation Seoul branch held an exhibition of the latest DLPTM* (digital light processing) LED display wall cube systems manufactured by Mitsubishi Electric Corporation, at the Imperial Palace Hotel Seoul on October 25, 2012. A total of four models was exhibited with the focus on wide screen display wall cubes, for which the market share is anticipated to increase in the future. Visitors to the exhibition were highly impressed by the large 72-inch screen display wall cube and actively participated in the Q&A session on the technological aspects of the products. Front projector models with wide-screen displays (6,500 lm and XGA 6,000 lm) also attracted much attention. Approximately 140 people from around 70 companies visited the exhibition, and we hope to draw on this success to further expand sales in South Korea. *DLP is a registered trademark of Texas Instruments Inc.
Setsuyo Enterprise Corporation, wich is the overseas affiliate of Setsuyo Astec Corporation, exhibited FA-related products at the Taiwan International Touch Panel and Optical Film Exhibition ("Touch Taiwan 2012") held between 29 and 31 August, 2012, at the Taipei World Trade Center Nangang Exhibition Hall. Held for the first time ever this year, the exhibition served as a comprehensive venue for the display of touch panels and optical film, as well as their manufacturing equipment and components. Approximately 300 companies participated in Touch Taiwan 2012, emphasizing the keen enthusiasm in Taiwan's touch panel industry. The display area was divided into three zones-the Touch Screen zone; the LCD Panel (Module), OLED Panel (Module) and Next Generation Display (Module) zone; and the Optical Film zone-that facilitated business talks and negotiations to be held according to their purpose. Touch Taiwan 2012 provided a remarkable opportunity to promote our FA-related products and services to manufacturers of flat panel displays (FPD) and touch panels, the demand for which is anticipated to remain consistently high into the future. We are committed to expanding our product sales in Taiwan and mainland Asia, where continued market growth is projected. Industrial Automation Beijing (IA-Beijing) 2012, China's largest exhibition that invited prominent manufacturers from inside and outside the country, was held at Beijing National Convention Center from July 20 through 22. Presented are Production Automation, Process Automation, and Robot technologies by category. The IA-Beijing also had a forum on the automated production line for automobile in China who has now become the largest automobile market of the world, and participants exchanged high-level opinions on automated production lines without hesitation. In China, much demand for Factory Automation is expected, and providing our FA-related products and its service system to the companies who are introducing automated equipment, we aim to expand sales in the Chinese market. Setsuyo Automation Trading (Shanghai) Co., Ltd.
Setsuyo Automation Trading (Shanghai) Co., Ltd. exhibited FA-related products at China International Industrial Fair 2011 from November 1st to 5th. 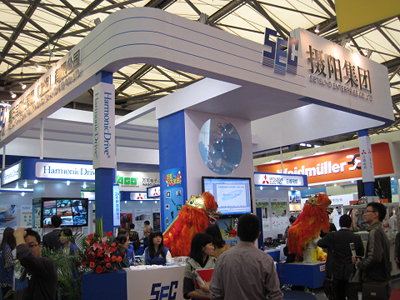 This fair is the largest exhibition of equipment manufacturing industry in China since 1999. This time the fair was divided into eight specialized fields. Setsuyo Automation opened their booth at the Industrial and Automation field and demonstrated such technologies as Production Automation, Process Automation and Robot. In China market it is continuously expected many demands of Factory Automation and the company made an impressive PR of Mitsubish: FA related products and service systems to expand sales in China.